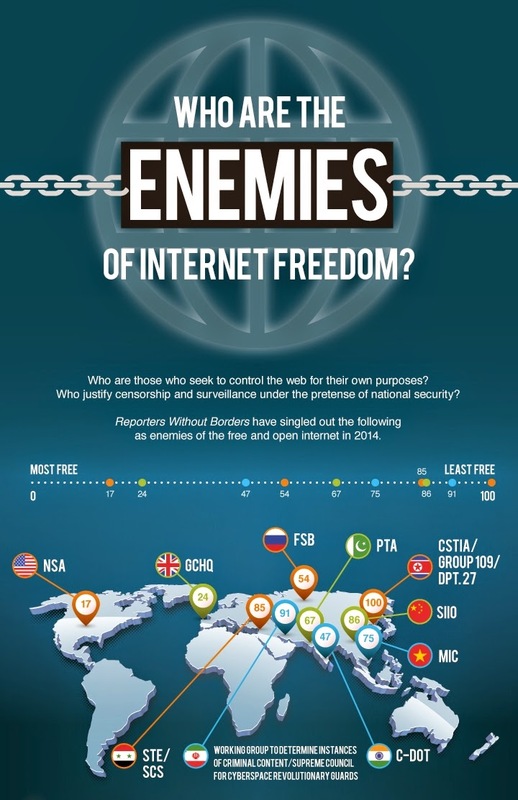 ARRA News Service: Who Are The Enemies Of Internet Freedom? 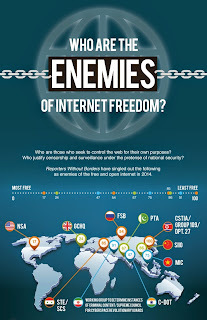 Who Are The Enemies Of Internet Freedom? Via Who nIs Hosting This? : Even though the World Wide Web is over 25 years old, we’re still in the Wild West of the Internet Age. An ever-expanding network of websites created by people all over the world, the World Wide Web is home to over a trillion gigabytes of data. The total number of websites online has just exceeded 1 billion, with hundreds of new sites going live every day. And as fast as the Internet is growing, notoriously slow-moving governments have a hard time keeping up. 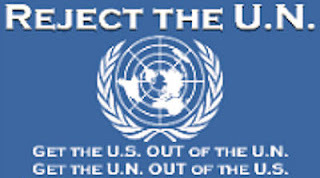 But that doesn’t stop some governments organizations from trying. Ostensibly in the interest of security, government organizations around the world are trying to monitor everything that happens online so they can stamp out illegal activity. The NSA is a famous example. In the name of security, they monitor United States citizens’ online activity, both public and private, on Google, Facebook, Skype, and even by spying on your smartphone. But the US isn’t the only country keeping a close eye on your every move: Countries on every continent have formed special organizations and task forces to monitor the activity of not only their own citizens, but of people around the world. And they’re not only monitoring activity, but restricting it as well. Any website deemed illegal or harmful to their citizens is blocked, including news sites, blogs, and even social media. In some countries they can even enter your home to search for illegal media if evidence of your activities is found online. Who’s watching your every move online? The NSA knows what you’re up to — but they’re not the only ones. Even countries you may think of as valuing the freedom of their citizens may not be governed by people who believe in a free Internet. Think you have Internet freedom? We might for now, but you’re still being closely monitored. Here’s who’s doing the watching. Tags: Internet Freedom, enemies, To share or post to your site, click on "Post Link". Please mention / link to the ARRA News Service. and "Like" Facebook Page - Thanks!